Vanguard on launch pad (TV-3), Dec. 6, 1957. It seems hard to believe but 60 years ago on Wednesday, on September 9, 1955, the U.S. Department of Defense chose Project Vanguard to carry out the American commitment to launch a scientific satellite into Earth orbit to support the International Geophysical Year. Vanguard was to be managed by the Naval Research Laboratory located just outside of Washington, D.C. This effort actually originated in 1952 when the International Council of Scientific Unions established a committee to arrange an International Polar Year, the third in a series of scientific activities designed to study geophysical phenomena in remote reaches of the planet. The Council agreed that July 1, 1957, to December 31, 1958, would be the period of emphasis in coordinated research about the Earth, in part because of a predicted expansion of solar activity; the previous such efforts had taken place in 1882-1883 and 1932-1933. Late in 1952 this body expanded the scope of the scientific research effort to include studies that would be conducted using rockets with instrument packages in the upper atmosphere and changed the name to the International Geophysical Year (IGY) to reflect the larger scientific objectives. In October 1954 the Council, at a meeting in Rome, Italy, adopted another resolution calling for the launch of artificial satellites during the IGY to help map the earth’s surface, and both the Soviet Union and the United States accepted the challenge. There followed a heady competition between the Naval Research Laboratory on the one hand and the Army’s Redstone Arsenal on the other for government support to develop the IGY satellite. Project Vanguard, proposed by the Navy, was chosen on September 9, 1955, to carry the standard in launching a non-military satellite for the IGY effort, over the Army’s “Explorer” proposal. The decision was made largely because the Naval Research Laboratory candidate did not interfere with high-priority ballistic missile programs–it used the non-military Viking rocket as its basis–while the Army’s bid was heavily involved in those activities and proposed adapting a ballistic missile launch vehicle. In addition, the Navy project seemed to have greater promise for scientific research because of a larger payload capacity. The Viking launch vehicle was also a proven system; it had first flown in the late 1940s while the Army’s proposed rocket, the Redstone, had been launched for the first time in August 1953. Finally, the Naval Research Laboratory’s proposal was more acceptable because it came from a scientific organization rather than from a weapons developer, in this case the Redstone Arsenal. This image from Life magazine depicts senior Project Vanguard leaders: Milton W. Rosen with John T. Mengel, Project Director J. P. Walsh, Lt. Cmdr. J. W. Salter. and Project Director John P. Hagen. The architect of Project Vanguard, Naval Research Laboratory engineer Milton W. Rosen, called for the development and launching of six spacecraft for an estimated $20 million, a bargain price even for the 1950s. The proposed launch vehicle combined the Viking first stage, an Aerobee sounding rocket second stage, and a new third stage with a 3.5 pound scientific satellite payload. Project Vanguard enjoyed exceptional publicity throughout the second half of 1955 and all of 1956, but the technological demands upon the program were too great and the funding levels too small to foster much success. Almost in desperation the laboratory launched the first Vanguard mission on December 8, 1956, a suborbital instrumentation test using a Viking rocket without the attendant second and third stages. Declared a successful flight, this mission nevertheless documented in graphic terms that the American IGY satellite effort was behind schedule; with the time left before the IGY there was little likelihood of orbiting a satellite unless resources approaching $100 million were applied to the program. Project Vanguard could not secure that kind of money from the parsimonious Department of Defense, which was supplying it from the secretary’s emergency fund. During the next several months the Eisenhower Administration became increasingly concerned with the tendency for Project Vanguard to get bogged down. Eisenhower was especially concerned about the probability that the scientific instruments were slowing it down. About five months before the Soviet orbiting of Sputnik 1, the president forcefully reminded his top advisers that “Such costly instrumentation had not been envisaged” and “stressed that the element of national prestige…depended on getting a satellite into its orbit, and not on the instrumentation of the scientific satellite.” Eisenhower’s perception of the budgetary growth of the Vanguard program, transforming it from the simple task of putting any type of satellite into orbit into a project to launch a satellite with “considerable instrumentation” reminded him of the worst type of technological inflation, as every scientist seemingly wanted to hang another piece of equipment on the vehicle. Thus, less than a year before the launch of Sputnik 1, the United States was involved in two modest space programs that were moving ahead slowly and staying within strict budgetary constraints. One was the highly visible scientific program, Vanguard, in honor of the IGY, and the other was a highly classified program to orbit a military reconnaissance satellite. They shared two attributes. They each were removed from the ballistic missile program underway in the Department of Defense, but they shared in the fruits of its research and adapted some of its launch vehicles. They also were oriented toward satisfying the national goal of establishing “freedom of space” for all orbiting satellites. The IGY scientific effort could help establish the precedent of overflight of other nations with space vehicles, while a military satellite might excite other nations to press for closure. Because of this goal a military satellite, in which the Eisenhower Administration was most interested, could not under any circumstances precede scientific satellites into orbit. The IGY satellite program, therefore, was partly a means of securing the larger goal of open access to space. 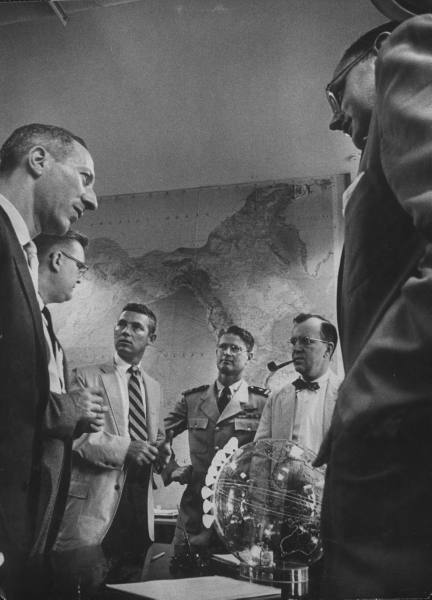 Eisenhower was willing to place the military effort on simmer to ensure that scientific satellites led the way, hence his pressure on Vanguard. What became clear later was that he was not so concerned about orbiting the first satellite as he was about securing the precedent of free access to space for the U.S.
Sputnik 1 changed the direction of space policy in the United States after its launch on October 4, 1957. He never accomplished that task of “freedom of space” with Vanguard. Before it could fly the Soviet Union launched Sputnik 1, and its overflight of other nations indirectly accomplished this geopolitical objective. Had the U.S. launched first, it raises the fascinating question of whether or not the Soviets would have protested overflight and thereby set up a problem for the use of reconnaissance and other types of satellites that might pass overhead in space. The Vanguard explosion on the launch pad, December 6, 1957. 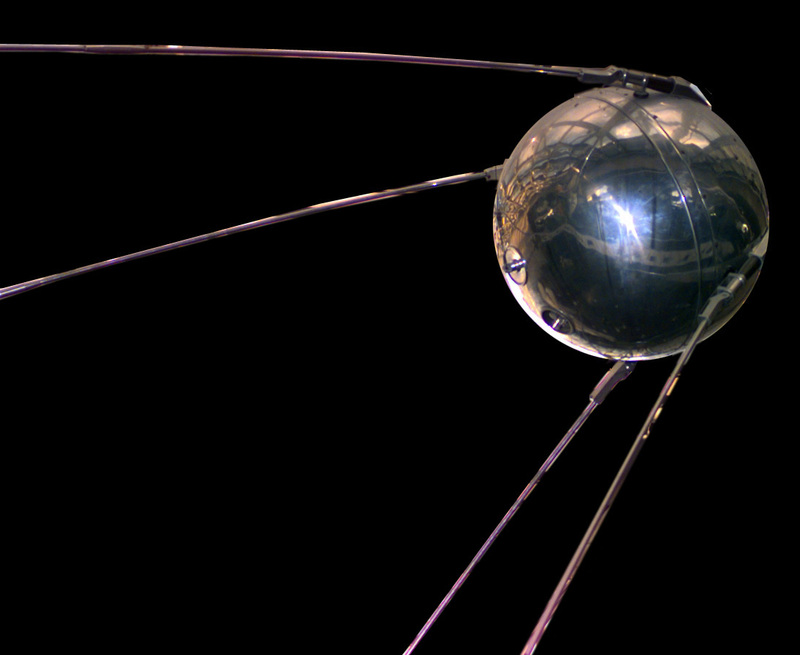 Sputnik 1 both changed the nature of space science and the Vanguard program. 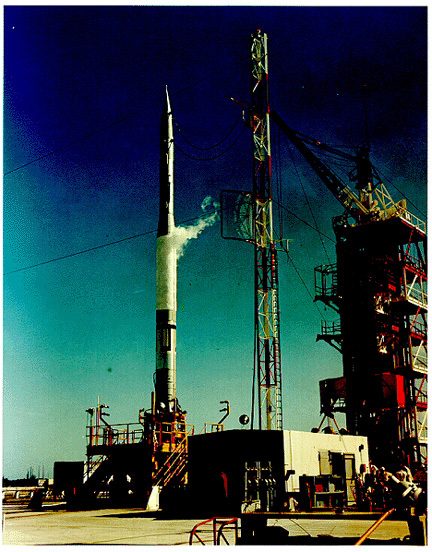 Within weeks accelerated efforts for American spaceflight had been placed in motion and Vanguard tried to launch its own satellite on December 6, 1957. The media was invited to witness the launch in the hope that it could help restore public confidence after the Soviet success, but it was a disaster of the first order. During the ignition sequence the rocket rose about three feet above the platform, shook briefly, and disintegrated in flames. The next test was little better. 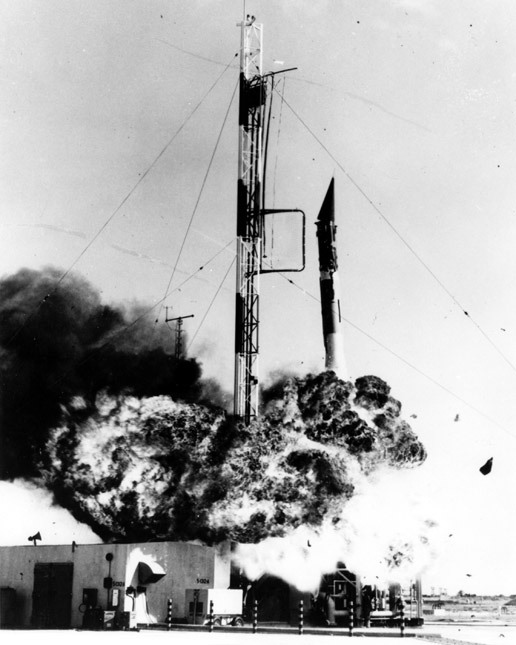 On February 5, 1958, the Vanguard launch vehicle reached an altitude of four miles and then broke apart. Public perceptions of American technological capabilities were extremely low after these two failures. A video of this launch attempt and explosion is available on YouTube at: http://www.youtube.com/watch?v=zVeFkakURXM. Vanguard finally was successful in putting a satellite into orbit on March 17, 1958. Vanguard 1 and its successor satellites conducted geodetic studies of the Earth, explored further the Van Allen Radiation Belt, and discovered the Earth’s slightly “pear” shape. Despite its later success, that first failure has forever tarnished the record of the program. This entry was posted in Cold War Competition, Science, Space and tagged History, public perceptions, public policy, U.S. Civil Space. Bookmark the permalink.